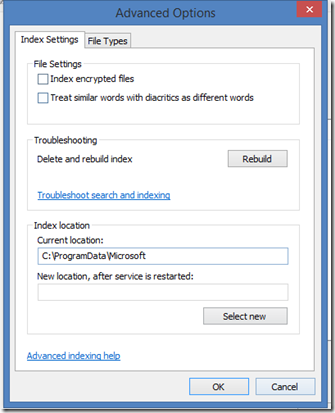 How to fix a VERY large Windows.edb file. I noticed my disk space is getting pretty low on my laptop. I used Treesize to determine that one of the biggest files was my Windows.edb file at 15.5GB in size. This is linked to the Windows Search services, and it contains information designed to make my searching faster. To reduce the size of this file, we can rebuild the index. Select the Advanced button, then select the Rebuild button. This will take a while now, but it will delete the windows.edb and associated files and commence reindexing your machine. Handy tip. Thank you. B. Trying to delete the ebd file without investigating the cause is a futile exercise. Indexing takes place based on the settings under Control Panel and find the Indexing section. Those with massive ebd files are most likely indexing some network share or file server (home or work). Deleting or simplt rebuilding the index will simply restart the process but the end will be exactly the same. Under Indexing look at what is listed and leave only your C drive, your profiles area and anything else you know you wish to be able to search for in the future. 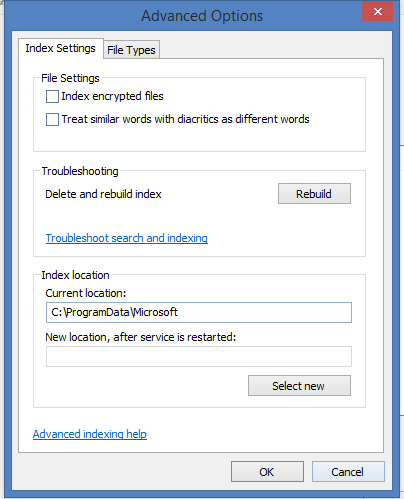 Using the Modify button deselect anything else and you’ll need to rebuild the index AFTER you edit the above. That is exactly what I was looking for. Not a bandage, but a cure. I’m using Windows 8.1 and the patch dosen’t work… Have anyone else a cure? Windows.edb Filesize today (Worldrecord? ): 1.382.078.016KB for ~10 million files. And it’s slow as f**k. After a rebuilt it was even bigger.